You have me sucked in. There better be a part 3! Great writing. Thanks, Kate. I am still working on part 3. Please tell me this is NOT your family! Why would you not want it to be my family? Because it is so sad!!! This is so gut-wrenching for me. I can’t imagine what it must be for you. I hope that the writing is therapeutic. This was my mother’s world before I ever entered the picture. As I write the stories down, I learn more about my mother and myself. Many of them I had to carry as secrets when I was younger, so it is a relief in one sense to see them outside of me. I’m hooked. Waiting for the next step in this series of tragedies. Like pouring iodine on a wound, maybe this will help the healing. I know it hurts terribly. I only heard the stories; I never lived them, but the other children did. My oldest sister especially lived through some very dark days. When I read your writing, the rest of the world stops. And sometimes, it takes a little while to get it started again. I’m so glad I had the good luck to meet you. Thank you. It encourages me to hear you say this. How do you squeeze so much truth into one sentence? Good grief, you can write. Your words make time stop; the clock freezes, and the air is heavy with the past. (I get lost in the story, and then remember this isn’t just a story; it’s a life. Your mother’s life. Your life). I read the next sentence, and the next, and secretly I’m pleading with your mother (and every mother) to make another choice, even though I know she will choose the other direction. NO! NO! But, of course, it’s already written in time. You’re simply unfolding the story as gently as possible, while allowing us to witness the pieces written across time. I haven’t read anything for a good long while. I’ve been avoiding reading. You’ve cured me. There’s no way I could stay away now. Thank you for sharing this with us. And for being as gentle as you can be when speaking the truth. You are amazing. Thank you for your comments, NT. I am happy that mom’s stories have spoken to you. Very rarely am I so touched by something I’m reading. Too often I feel manipulated. Too often feel a certain contrived legerdemain when the writing is slick and smooth. But you write from your heart, but keep its pulse beautifully under control. Giving your reader time to feel his own emotions … and find his own connections. I bleed for your mother … and am amazed at her bravery. Through everything she still keeps hope flickering but alive. I can see the mistakes looming in front of her, but she doesn’t flinch, she barrels right into them headfirst. And to be reminded of a time when women’s recourse to safe abortion was a coat thanger pulls me up with a terrible sense of grief. I came of age just in time to benefit from “the pill”. And had forgotten that this little tablet gave freedom to women for the first time in history. And fairness. A lot of things going on for me in your story … and you’ve shared it so well … and like your mother, so bravely. The photos are treasures too, linking everything firmly to a long ago time. Thank you for reading. It’s hard to put these stories down on paper, not because it’s hard on me, but because I’m trying to make sense of them as I relate them. You always hope it will be different this time…..
Like a scientist in a lab with a lot of petrie dishes, .. If this is changed, then…..
We are all alike that way; making the same mistakes again and again, sometimes learning, sometimes not. Life is never straight forward and rarely untouched by sadness. I am hooked and cannot wait for part 3. Thank you. I appreciate your kind words. It has taken me a long time to write these stories down. I’m still working on stories about when she was younger. you are welcome, ma’am… i find it hard to write about my mother, have written about her only twice. she was a very strong-willed woman and she lived a rather colorful and challenged life. but i’ve realized that we must write about our mothers’ stories so that slowly and gradually we can come to terms with our own… ^^ i wish you luck and more courage… 🙂 cheerio! OMG. How painful. You told the story beautifully. By the way, the little girl in the middle, Peg, looks a lot like a pic I have of my mother at about that age. What year was the picture taken? Just curious. 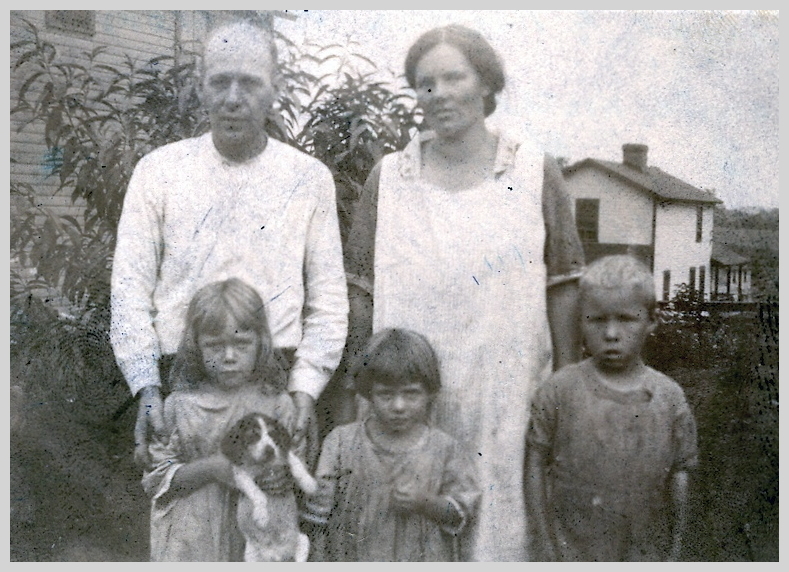 There’s no date on the picture, but judging by mother’s size, I would say between 1925 – 1927. Whew, what I story! I hung onto every word as I read these posts. You wrote it in such a wonderful way about some very difficult and complex situations. I’m also looking forward to Part III. Thank you so much for reading, Sheryl. I’m glad you enjoyed reading them. Loneliness can be devastating for some people, to the point where they’ll make the wrong decisions just to have a partner. I can’t wrap my mind around some decisions I’ve made, much less understand the thoughts or motivations of a stranger. I certainly feel for her, and wonder at the desperation (or determination?) that would cause her to risk her own life in aborting the pregnancy, but not propel her to leave the man, to cut out the root of her problems. Figuring life out is not easy and sometimes it takes all that we have, and then some. You are so right. We have a difficult time figuring out the reasons we do things, much less the reasons other people have for the things they do. Very sad, but beautifully narrated.